Old accumulators must be stored in a closed and protected area, not exposed to the elements: rain, snow or strong sunlight, etc. They must be placed lid upwards, to protect against any leakage of the electrolyte. If the battery case shows signs of serious damage, e.g. if it is cracked or broken, the battery must be stored in a separate plastic box so that any electrolyte escaping from it does not spill into the floor or ground and can be collected for recycling. If the volume of waste accumulators is high, storage should be in UN-certified plastic containers, approved for the collection and containment of such materials. This guarantees greater protection of the collection area in the case of any electrolyte leakages. Both collection and transport are to be carried out only by state-licensed companies who must hold the relevant certification from the Ministry of the Environment and Energy. They must also have a valid contract with a Collective Alternative Management System for Waste Batteries and Accumulators. Certification of the companies in question is subject to the verified soundness of their vehicles and drivers training in transportation of hazardous waste in order to deal with any problems that may arise during its transportation. It is noted that, at the time of waste collection, the licensed companies are required to complete and provide the company delivering the waste with a Ministry-approved collection form to demonstrate proper collection and transportation of the waste. 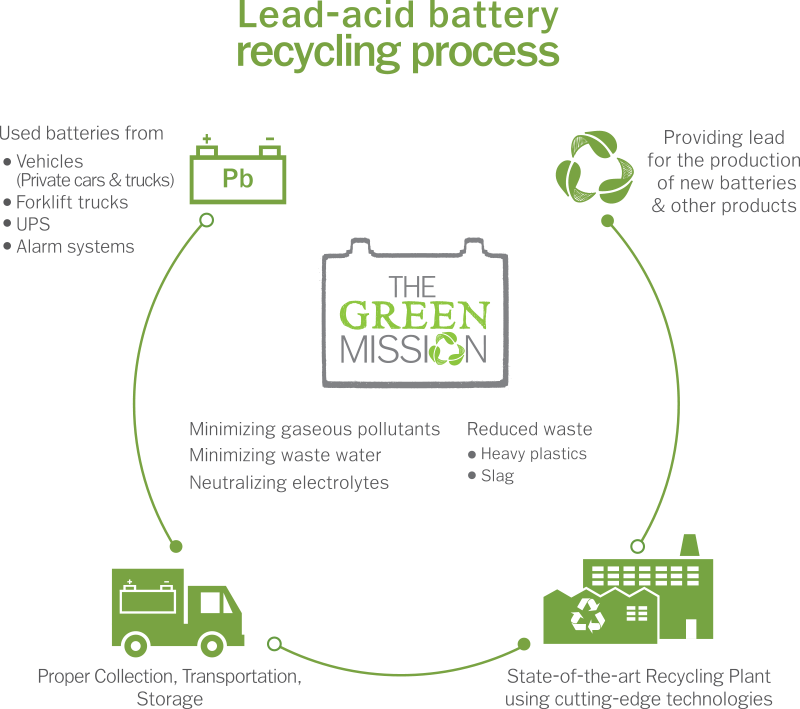 The primary aim during the lead-acid battery recycling process is for it to have no negative impact whatsoever on the environment. To achieve this, each company and recycling plant must adopt cutting edge technology solutions to minimize air and water pollution and waste, including its operational waste. The leap in the technology currently used in the recycling industry has made it possible to minimise gaseous and liquid waste, while simultaneously reducing the amount of waste produced. In accordance with the applicable European Directives, recycling plants are required to neutralize the electrolyte and convert it into gypsum or salt. In the latter case in particular a waste material is converted into a by-product that can be reused, primarily in glassmaking. Again, in accordance with the applicable European Directives, heavy plastics must be handled only by companies that are competent for its management. Unfortunately, at present, the only companies appropriately managing these hazardous materials are to be found abroad. Domestic lead acid batteries recycling companies are required to export these materials, classified as hazardous, under the relevant regulations of the Basel Convention. The burning of heavy plastics is prohibited, firstly because they have no significant calorific value and, secondly, because they comprise a mixture of plastic, lead and electrolyte, which during the combustion process releases dangerous toxins of particular harm to both man and the environment. European Directives indicate that slag is a very dangerous and highly toxic material. This is why it must only be handled by companies having the appropriate infrastructure for its management. Such companies can only be found abroad. They manage these hazardous materials optimally before sending them to be processed and buried in special areas that are specifically designed, and which operate in such a way, as to have zero environmental impact. The lead-acid battery recycling plants are required to export these materials, classified as hazardous, under the relevant regulations of the Basel Convention.